I have been writing reviews for theatrical pieces for a couple of months now, and I have had the pleasure of attending professional plays by official companies. Attending Abigail’s Party was the first opportunity I have had up until now to view a LUTG show. I must say, before anything, that Abigail’s Party is a very funny play: it was ideal for students who want to sit and have a laugh for a couple of hours and forget about the stressful last weeks of term. 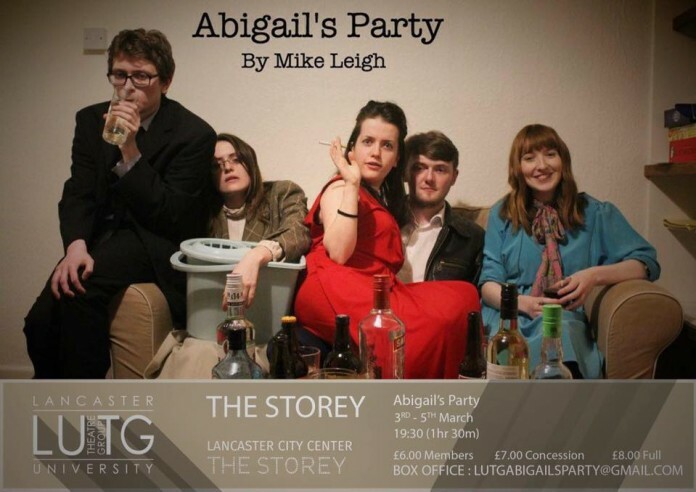 I did a bit of research in order to have a better idea of what I should expect from the play, and I learned that Abigail’s Party was an actual 1977 theatrical show written by Mike Leigh. The student­ run interpretation of it seemed to me like a perfect approach, especially from our XXI Century. I particularly enjoyed how they set the whole scene: the decorations, the lights, the character’s clothing and the overall old school ambience they achieved. We can see how hard they try to behave as sophisticated as possible to impress each other. It is obvious in many cases that these two couples are not really content with their marriages, to the point that we see how Beverly (the main character, and in my opinion, the best performance) flirting with Tony (Angela’s husband) as soon as the alcohol makes an effect on the group. In my opinion, the funniest part of the play was how the worried mother, Sue, ends up completely drunk in the attempt to relax and not stress too much about her daughter’s party, having heard all kind of things that could be happening there… The actor really did a great impersonation. Generally, every actor seemed to be totally comfortable with their roles. They understood the character they were representing very well, it was very convincing. Overall, it was very easy to evade from our times and imagine that we were all enjoying the little gathering. However, there are a few things I would like to mention. During the play, I was somehow trying to find the ultimate point or moral of the story, and I felt like there was no clear intention or story to follow. The show lasted for over two hours and we were not noticed about the interlude (so it seemed as though the play was over), but which made me hope that the plot of the story would be developed in the second part. Nevertheless, it all followed in a very linear, stable way, in which we are witnessing some people arguing and drinking, but not solving any problems or working towards any goals. This only made the play seemed to last forever at some point, but hearing the audience laughing out loud and clapping every now and then showed me that there was something more to it than just a group of people having a good time. What I think played an important role in the success of this play was the audience who was there to encourage their actor friends. I am sure the Theatre Group delivered a great fun time for them as much as they did for the rest of us, and I am looking forward to attend another play in the near future. The Lancaster Theatre Group has given me a great first impression! Previous articleStartup Stories careers talks are back!